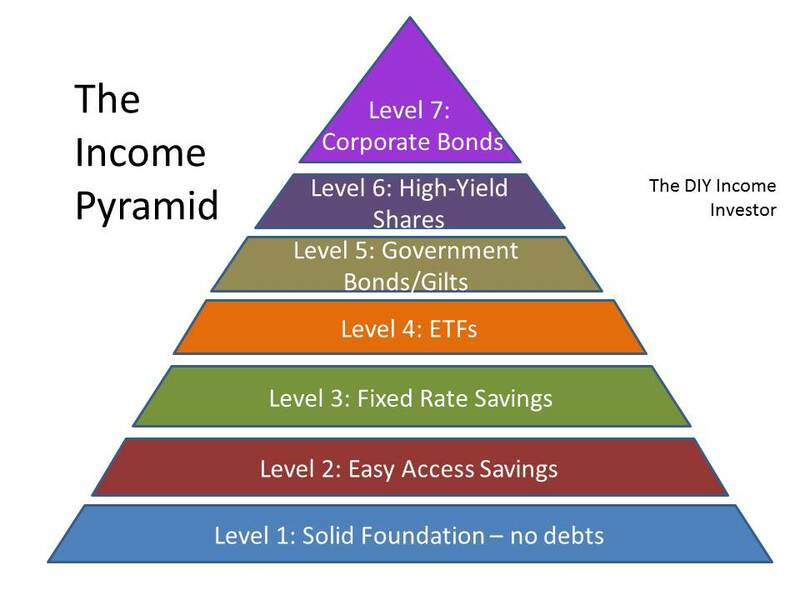 One way to understand the DIY Income Investor approach is to think of the different types of potential income as an 'Income Pyramid' - that is, layers of different sources of income, all built on a sound foundation and increasing in complexity (and hopefully in after-tax returns). I'll go through these income layers 'from the ground up'. At all levels you should be considering ways to protect your income and investment from the Taxman (more about that below). First, you shouldn't really consider significant savings or investment if you have debts. This isn't an area that I will try to cover here but there are many excellent Internet resources - for example here (UK). A key element is to live well within your means. If you are paying off a mortgage, fine - learn to be a DIY Income Investor on a small scale, but aim to pay off your mortgage as quickly as you can! Second, you will clearly need some money to invest. This could be by reallocating existing savings or by regular saving. The DIY Income Investor approach is a 'get rich slow' strategy and it will take time to build up your wealth. You may need to spend some time getting this stage right, as there is not much point going further until you have either net, surplus income to invest or existing savings that could be better invested. The first layer of savings should be an 'easy access' bank account. You probably have something like this already - a high-street current/checking account, for example. However, if you are regularly overdrawn - go back to Level 1! Your 'easy access' savings should be on-line (i.e. one or more Internet accounts). The easy management of the DIY Income Investor strategy is helped by having your investments on-line, as far as possible. How much you keep in 'easy access' accounts will depend on your expenditure levels and degree of caution: let's say 3 to 6 months' expenditure. Even though it is the first layer of investment, you must focus on the rate of return, as the DIY Income Investor strategy is all about optimising the rate of return of your investments. Once you have a sufficient 'buffer' of 'easy access' savings you can consider the possibility of fixed-rate savings bonds, which tie up your money for a period of time (sometimes several years) in return for a guaranteed rate of interest (which - obviously - should be higher than you can get for 'easy access' savings). You might consider a number of these accounts, committing your money over different time periods. ETFs are the most cost-effective and least risky way of investing in shares, government bonds/gilts and corporate bonds. Many investors - those who do not want to spend a lot of time with their investments - can stop at Level 4. A portfolio of cash plus ETFs, shielded from the Taxman, is all you really need. However, if investing interests you, and you are willing to put in some additional work, the next levels may be rewarding. With increasing investing experience (and growing funds) you may want to try investing directly in specific government (or in the US, municipal bonds). This carries more risk than investing through an ETF (e.g. default risk) - but also potentially more reward, in the form of higher after-tax yields. Investing directly in companies paying good (and hopefully regular) dividends is a way to grow both income and capital. It is also more risky than buying an ETF (which is diversified). However, this is an interesting investment area, if you have the inclination. Buying corporate bonds or other forms of fixed-income corporate debt directly is more risky than buying a diversified holding through an ETF. However, there are times in the economic cycle when you can 'lock in' some very attractive rates of return. At all levels of investment you need to protect your growing income from the government's Taxman. This will obviously differ on your location. In the UK, if you are building up your wealth (and you are a taxpayer) you might consider a Cash ISA temporarily while you are building up your savings, which you can convert to the much more flexible Stock & Shares ISA at a later date. A SIPP is similar in operation to a Stocks & Shares ISA but with withdrawals allowed only after you have reached a minimum retirement age. I;ve included a company pension plan in the list. Although it is not DIY, it may be a good tax-efficient way to build up your wealth and future income. In many cases the company will contribute to your pension fund and allow some flexibility in how your pension is invested. Later posts will talk in more detail about all of these layers of income investment how to minimise risks and how to blend the layers of income investment to a mix that you are comfortable with. I've been following the site for a little while, and would be interested in how you view the National Savings, Index Linked certificates. Currently they are at RPI +0.5%, so while not fixed rate, they appear to offer a good shelter, somewhere around 5.5% (Tax Free). Is there any reason you couldn't add an annuity to part of your pyramid? Simple answer = I don't see an annuity as part of your self-managed portfolio - rather as part of your pension. Maybe - but too late now (late Sept 2011). The problem is forecasting inflation - if this is going to fall, then it's not such a good investment compared to some of the other fixed-return options available. I'm planning on using NS&I Index-Linked Savings Certificates to protect the purchasing power of my Emergency Fund (6 months expenses) when they become available again. This money is currently in the highest paying Cash ISA I can find (Northern Rock, paying 3.05%). Rather than cash out my Cash ISA, I will probably use extra cash to do it. So I will have a mix of both. 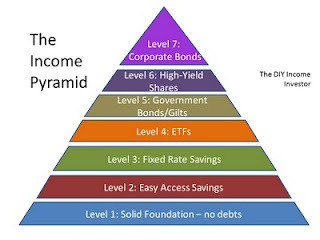 I see from the pyramid that you recommend ETFs rather than ordinary Index Trackers. Is there a reason for this? I have to admit that I have just found your blog so you may have answered this question already. By the way, it's great to find a British investing blog, most of those I've found are American. I surfed in here from Monevator. I'm looking forward to reading your old posts and catching up to date. 3) An index fund (or ETF) tracks the capital value of shares but here I am interested in mainly income - hence the emphasis on ETFs that are linked to dividends or bond/gilt coupons. I worry less about the market going up and down and more about the income I am receiving from my investments. First, thanks for your blog. I read through everything and also read through your book. I am from Switzerland, and sadly here it's a bit different. Most of your general advice is true, but corporate and government bonds are useless here (which makes it easier). And, I don't know any company paying dividends more than once a year here. Although when I read your blog and ebook, I saw that what I did till now I am on the right path already :-) I just made it the different way, got shares with high yield dividends first (just after the low in 2009) and now I am pumping some not needed money into ETFs which makes my portfolio more diversified. Yes and no - drip-feeding has its advantages, as you say - but my approach is based on the observation that different asset classes (including different ETFs) fluctuate in yield and I like to invest lump sums in whatever has a higher yield (subject to not exceeding my maximum 5% holding limit).